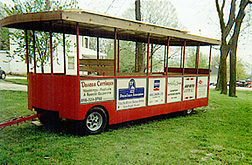 A simple inexpensive solution for farms and institutions to move up to 25 passenger in a perimeter layout. Can be drawn by a Truck, Horse, Pickup, Tractor, etc..
Ball Bearing Suspension, can be moved by one person. These units are build to order, 45 days for delivery.